Hello and Happy First Day of Spring!!! I'm so lucky to live in an area where in general the weather feels like what you would expect for each season - it's hot in summer, cold and winter and while some years we don't get the perfect day on the first day of spring it is starting to warn up and some flowers have begun to bloom. As much as I'm a planner I have a terrible time shopping for clothes in advance - when it's cold I want to wear sweaters and when it's warm I want cotton dresses gosh darn it so typically Easter creeps up on me and the week of I find myself scrambling to find something to wear. Yes of course I could just pull something I love from my closet but Easter represents new life and new beginnings and I always like to treat myself to a new dress. When selecting an Easter dress the most important thing to me is finding a dress that says hello, it's SPRING. But almost as important is dressing appropriately for the weather where you live this time of year. 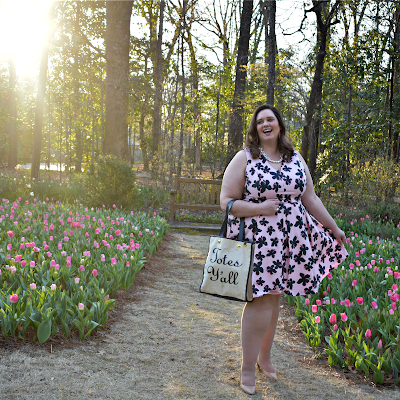 Last year it was muggy and miserable on Easter, the year before rainy and cold so we Memphians never quite know what we're going to get so I tend to go for a dress that on its own is good for warmer weather but could easily be paired with a cardigan or light jacket. 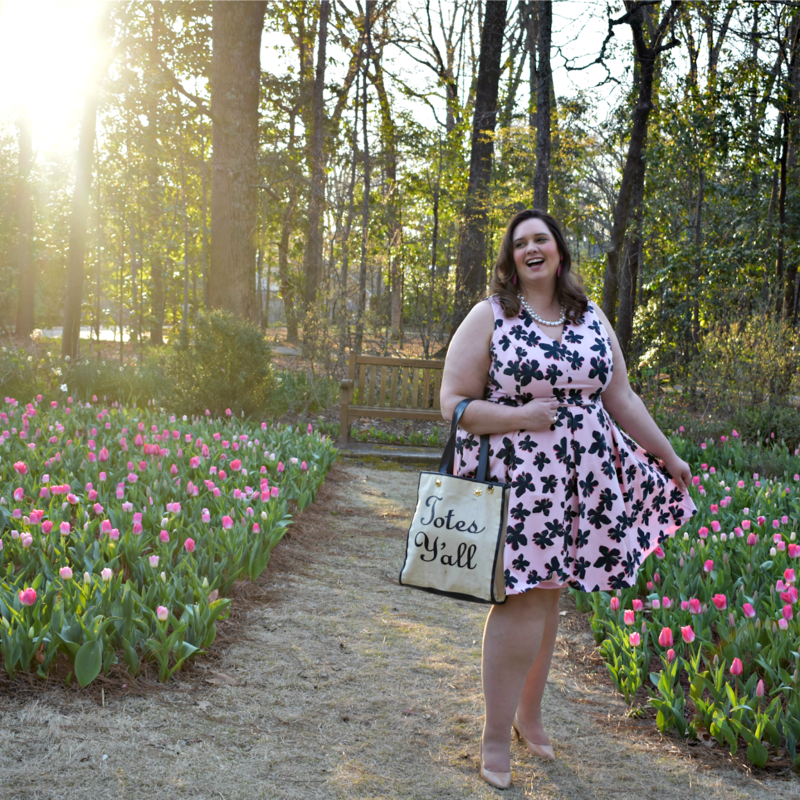 I knew the second I saw this dress in the Eloquii x Draper James collection that it would be my perfect Easter dress. I love a fit and flare style, knee length dresses are my jam and between the colors and print this dress is oh so spring. While I tend to get a new dress for Easter and I tend to spend a little more on my Easter dress than other dresses I might buy through out the year I always want to buy a dress that will go well in my closet and is something that I can wear all season long. In these pictures I'm wearing with pearls and heels for a more dressy look but I also plan on wearing with flats and my denim jacket to dress it down a little. I'm still playing around with whether to add a belted cardigan or a white button down underneath because I'd also love to make this dress work appropriate (more to come on that because I'll admit even for me it's REALLY feminine and perhaps a bit too much for the office). Typically when I buy a dress I expect to be able to wear it at least three different ways but if a dress is really fabulous like this one is I'll bend my own rules a little. Easter in my opinion is always a good time to get a nice family picture as everyone is dressed in their finest so while I don't advocate for the matchy-matchy look my Mom and I rocked in the 80s Easter dresses I do think it's nice when the colors of a family coordinate and don't clash so what your family will be wearing is also something I think is important to consider when selecting your dress. This year I'll probably suggest to Shaun he wear a navy shirt but hey if I can get him in pink I'll take that too. Our dogs are not fans of taking pictures but it wouldn't be a holiday without me trying so here's so hoping I have a nice picture to share with y'all this year. Also, special thank you to The Dixon Gallery and Gardens for serving as my location for this shoot. I am working on a post coming to y'all soon sharing more of this beautiful setting but I just couldn't keep all the pics to myself while working on it.